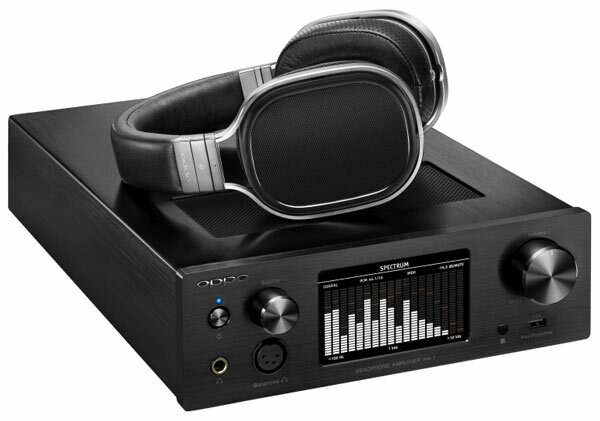 Shortly after the launch of its PM-1 planar magnetic headphones (as seen here), OPPO Digital has released another member of its family of personal audio products – the HA-1 headphone amplifier. OPPO Digital is well known for its reference quality universal Blu-ray Disc players, and the HA-1 headphone amplifier builds upon the success of the BDP-95 and BDP-105 audiophile players. Drawing on the proven circuit design of these award-winning players, the HA-1 combines an uncompromising analog audio section with the latest technologies in digital audio. The analog audio section of the HA-1 is a fully balanced design with an emphasis on keeping the audio signal in the analog domain once it leaves the DAC. The HA-1 is anchored by a hefty toroidal power transformer, and linear power regulators and filters with custom made capacitors ensure that the headphone amplifier has a clean power source with plenty of reserve energy. The fully balanced Class A power amplification section uses hand-picked and paired discrete components to ensure symmetry, and a motor-driven precision volume control knob allows for both manual and remote control volume adjustment while keeping the audio in a pure analog audio path. Oppo HA-1 headamp with the matching PM-1 planer ‘phones. The HA-1 is especially suitable for high-resolution digital audio playback. Its digital inputs include coaxial, optical, balanced AES/EBU, and an asynchronous USB DAC. It is easy to connect the HA-1 to digital audio players or to a computer running the listener’s favorite playback software. The USB DAC supports PCM audio up to 384 kHz 32-bit resolution and DSD audio up to 256x the CD sample rate. The same ESS 9018 Sabre32 Reference DAC and output driving stage used in OPPO audiophile Blu-ray players ensure extremely low noise and low distortion performance. The HA-1 is compatible with Apple’s iPod, iPhone and iPad for use as an external DAC, enabling the listener to directly tap into digital music played from these devices. For additional convenience, the Bluetooth audio transport with high quality aptX CODEC sets music free from mobile phones with a performance boost. OPPO has designed the HA-1 headphone amplifier with the same versatile approach as its Blu-ray players, so while the HA-1 is a high performance headphone amplifier, it also doubles as an asynchronous USB DAC, a stereo pre-amplifier, a digital audio dock for mobile devices, and a Bluetooth audio transport. Users have a choice of using the 4-pin balanced XLR or the traditional quarter-inch headphone jack. Line level analog inputs and outputs are provided with both RCA and balanced XLR sockets. The HA-1 is a desktop component housed in an aluminum chassis, and the familiar volume and source selection knobs are complemented by a 4.3-inch color screen for easy operation. While music is playing, the screen can show a classic VU meter, a modern spectrum display, or detailed technical information about the audio signal. A supplied IR remote and a smartphone app provide complete control and convenience. The black version of the HA-1 is available now at a retail price of $1,999, and the silver version is estimated to be available in July. There is no “guy” running OPPO in NZ – the distribution is now handled by International Dynamics NZ, and they seem to be building the brand pretty nicely from what I can tell. Easy to deal with too.